The best thing you can do to familiarize yourself with the iPad is just to play with it. You’ve got to be willing to explore by tapping, pinching, and swiping away. One of the core design principles at Apple has been that their systems should be intuitive. As you learn some of the basic interactions, you simply need to explore these common icons and gestures in different apps. 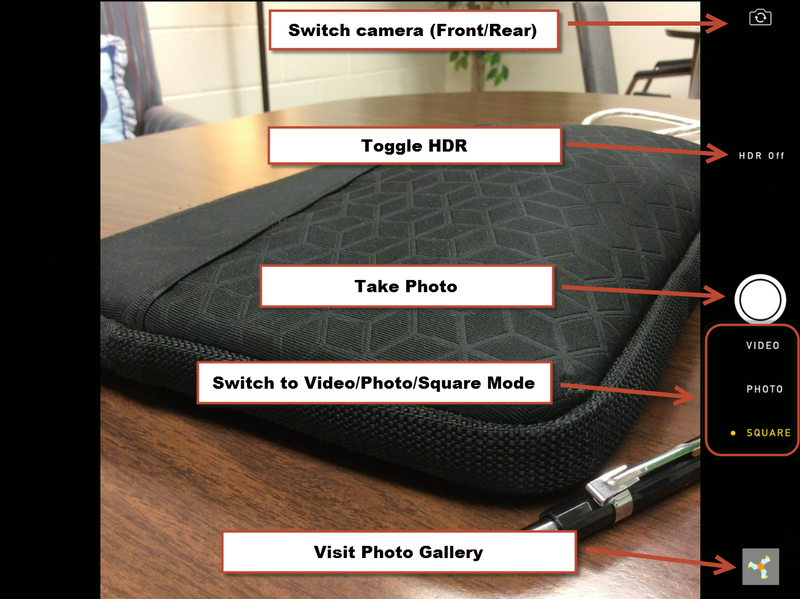 Below are some the most basic tips and tricks that help teachers (and most general users, as well) to navigate their iPad. 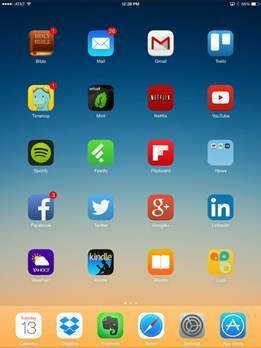 When you are on the Home Screen, you can simply tap on an app’s icon to launch the app on the device. Once an app is launched, all you need to do to exit the app is click the home button at the bottom of your device: Apps don’t completely close down when you move to the home screen. They also don’t “run” in the background unless you have Background App Refresh enabled for the app. An app will save its state and you can return to the app later. 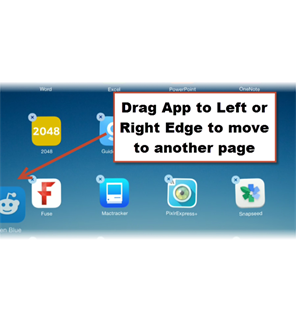 To completely close an app, double tap the home button and then swipe across to find the app you want to close. To close the app, swipe the app up and away. The control center is a new addition to iOS 7 which makes it very efficient to toggle on and off certain things. To activate and get into the Control Center, you swipe up from the bottom of the screen. Current versions of IOS (6 and 7) allow for app switching which means that your apps will save their current state in memory and you can return to them. This is much like having multiple windows open on a Mac or PC, but you can only view one app at a time. 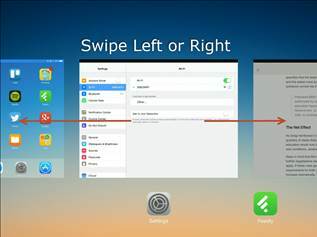 To switch to a recently opened app, double tap the home button to access the app switcher. Swipe left or right to view apps and tap to open. Many apps that you install will request permission to notify you with updates. For example, Facebook might want to notify you when someone has liked your status. The Mail app can notify you when you have new mail. There are three types of notifications in iOS 7: icon badges, alerts, and banners. Additionally, notifications can play a sound when received. The Notification Center gives you a quick view of all recent banner notifications you have received. To access the Notification Center, swipe down from the top of the device. You can add additional keyboards to your iPad, meaning that when you are in an app where you want to type, you can use international keyboards (e.g., Japanese or Cyrillic). There is also an Emoji keyboard that includes scores of different pictures (think emoticons on steroids). Go to Settings and tap General. Near the bottom, select Keyboard and then tap Keyboards. Tap “Add New Keyboard…” Select any keyboard you wish. You can find and download new apps from the App store. To install a new app, open the App store and search for an app. For example, to install the iBooks app (Free), open the App store and tap on the search field at the top right and type in ibooks. Then tap Search on the keyboard. Next to the app you want to install, tap the Free button or the price of the App. Then tap install. You will be asked to enter the password for your iTunes account that you have set up on your device. The app will begin downloading and installing and will appear on your Home screen. To remove an installed app from the device, you can tap and hold any icon on the Home Screen. Once the icons begin wiggling, tap the “x” at the top left of an app. To stop the apps from wiggling, you can tap your home button. To arrange your Apps on your Home Screen(s), you can tap and hold the icon of any app until they start wiggling. Tap and hold on an app, then drag it to the location you desire. 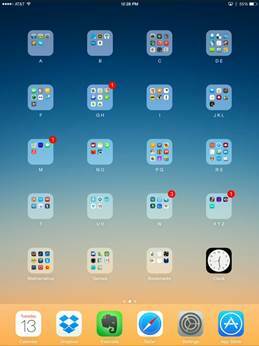 You can also drag one app on top of another to create a folder to hold apps. You can tap to open a folder and then tap on the name of the folder to change its name. You can also drag icons to the left or right edge of the screen to move them to another page. There are also six spots on the main taskbar at the bottom to hold your favorite apps. You can even place folders on the taskbar. There is no limit to the number of apps you can place in a folder. 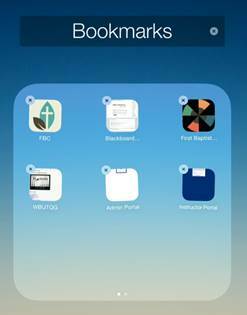 Many teachers will be using an iPad that either belongs to the school or has apps that are purchased for them by the School. 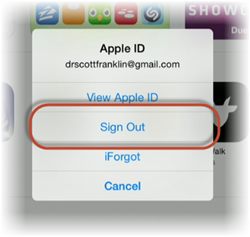 It is fairly easy to switch between different accounts in the iTunes store. This will allow you to install apps that have been purchased with different iTunes accounts. First, open the App Store and go to the Featured area. There is a “Feature” tab at the bottom left of the screen in the App Store. There are TWO different ways that sound must be muted to silence your apps. By default, the slider switch on the side of your device is set to be a mute switch. If you can changed the configuration of this switch to lock rotation instead, then the mute option will be available in the control center (i.e., swipe up from the bottom). You can also mute by holding down the volume down button on the side of the iPad. Also note that if you have any alarms set with your Clock app, THEY WILL STILL SOUND even when the device is muted, the volume is turned down and you have Do Not Disturb enabled. In addition to the Camera App, all iPads can also take screenshots (a picture of what’s on the screen). If you press the Power Button and Home Button at the same time, you hear a camera shutter sound and the screen will flash. You’ve just saved a picture of your screen in the Photo Gallery. To see your photos open the Photo Gallery App. Once the page has loaded, you can use your finger to scroll up and down on the page. Additionally, you can pinch to zoom. One of the nicest features of the Safari browser is the auto-zoom: double tap on a picture or a block of text and the Safari browser will automatically zoom to fit that web element. Double tap again to zoom out. In the sharing area, you can also perform other actions such as sharing the page to facebook/twitter, adding the link to home screen, copying the link, or printing the webpage. The browser also features tabs so that you can have several pages opened at once. To add a new tab, tap the plus sign to the right of the address bar. To close a tab, tap the “x” at the left edge of the tab. Tap on the tab to switch to it. When you have a file that can be opened in other apps, it is possible to move files from one app to another. For example, if you have an app like iAnnotate that allows you to write on pdf documents, you might want to surf the web to find the pdf and then open the pdf in the other app. You can also use this to move files to your cloud storage, like Dropbox or Google Drive. Consider the following example: we want to save a pdf document for later reading when we might not have internet access. We are going to find the pdf in the browser and them save it to iBooks for later review. When the pdf first loads, you will see options at the top left to “Open In…” If you’ve ever opened this type of file with an app, you will see “Open in [That App]” and “Open in…” If you haven’t, then you will only see “Open in…” Either way, tap on “Open in…” and then select iBooks. NOTE: If this “Open in…” does not appear at the top of the screen, just tap anywhere in the body of the pdf and it will re-appear. The pdf will now be available in your PDF collection in your iBooks library whether you are connected to Wi-Fi or not. If you have files that you want to get onto the iPad or pull off, there are a number of different ways to do this. Email: Possibly the easiest but least efficient means of getting files on and off of the device is using email. You can set up your email to download to your device, so you could email yourself attachments and then open in (see the previous tip). You can also “Share” from whatever app you are in and email the document to yourself. When you check your email on your computer, you will be able to download the attachment there. iTunes: If you use your computer to sync with your device in iTunes, you can also use iTunes to download files from different apps. When you select your device in iTunes, go to the Apps section for the device. 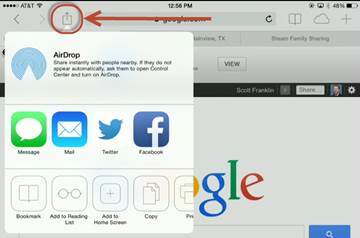 At the bottom of the screen, you will see a list of apps that will allow you to upload or download files. Cloud Storage: There are a number of different services that allow you to sign up for free cloud storage. The ones that I have used and recommend are Dropbox, Google Drive, Microsoft OneDrive (formerly, SkyDrive), and Box. You can search the web for the service and sign up for a free account. Then you can install the app for the service through the App Store. Each app will allow you to search for which files you’ve save to the cloud and then open them in a viewer. 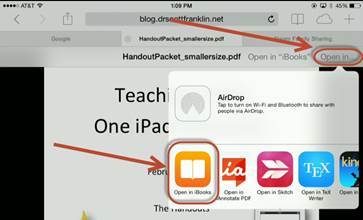 You can then use the “Open in…” Feature to open the files in other apps. You can also go the other direction and open files from other apps into the cloud storage apps. Several of the cloud storage apps also integrate with my favorite apps. For example, OneDrive integrates with the Microsoft Office apps. Dropbox and Google Drive integrate with iAnnotate. In each case that means that I can open files in my cloud storage directly inside that app. Now, go to any area where you would type with the keyboard. For example, open up the Notes app and start typing a note. When the keyboard appears, place your thumbs on the keyboard and then pull them apart. Voila…split keyboard! If you want to return it to normal, put your thumbs on it again and push them together. You can also slide it up and down by dragging the Keyboard button at the bottom right of the keyboard. I often get tired of having to type my full email address. There are also a handful of other phrases or sentences that I type regularly. You can configure keyboard shortcuts that work just like AutoCorrect that will replace shortcuts with longer text. For example, I have my iPad configure so that every time I type “eml” it is replaced with my email address. To setup keyboard shortcuts, open Settings and go to the General tab. Scroll down and select Keyboard. Then tap Shortcuts. To add a new shortcut, tap the plus sign at the top right. Enter the phrase and the shortcut then click save. 18. Do not use a Screen Cleaner. Don’t be tempted to pull out the Windex or glasses cleaner when you see all those finger prints all over the iPad screen. To clean the iPad, unplug all cables and turn off iPad (press and hold the Sleep/Wake button, and then slide the onscreen slider). Use a soft, slightly damp, lint-free cloth. Avoid getting moisture in openings. Don’t use window cleaners, household cleaners, aerosol sprays, solvents, alcohol, ammonia, or abrasives to clean the iPad. The iPad has an oleophobic coating on the screen; simply wipe iPad’s screen with a soft, lint-free cloth to remove oil left by your hands. The ability of this coating to repel oil will diminish over time with normal usage, and rubbing the screen with an abrasive material will further diminish its effect and may scratch your screen. Good stuff Dr. Franklin… Nicely done!